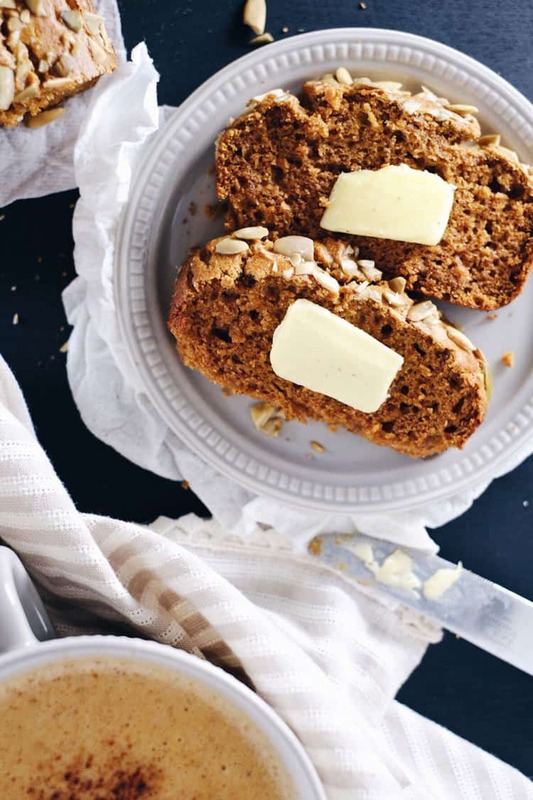 Fall is the season of pumpkin, and for me, Paleo pumpkin bread. Do you notice it pretty much feels like pumpkin spice is taking over the world? I am not mad about it though because I love pumpkin spice everything! The trouble is that all the pumpkin spice things you can buy at the store are loaded with crap and full of refined sugars. So. Much. Sugar. 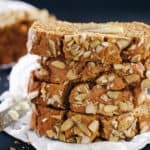 However, with just a little effort it is pretty easy to make your own Paleo pumpkin bread, filled with the bold spicy flavors you are craving, but free of the gluten, dairy, and refined sugar. I even crafted a nut-free bread this time using cassava flour, which is most similar to traditional flour. Eating nuts can really be a slippery slope for us. All of the sudden we look down and realize we’ve eaten half a bag of nuts, and then our stomachs pay for it. You know what I’m talking about, right? It’s way too easy to eat too many nuts. Baking without traditional flour easily lends itself to using nut flours, which is great, but can similarly lead to eating too many nuts. So, this year for the baking season I decided I would play with cassava flour, which is a resistant starch made from yuca, a root vegetable. On a mostly unrelated side note, if you are ever in the Portland, OR area go to a restaurant called Andina and have their yuca fries. They are delicious and served as a gluten-free alternative to their typical bread appetizer. They also have a full gluten-free menu. Not everything is Paleo friendly but there are definitely options! Ok, back to this Paleo pumpkin bread. Cassava flour is naturally nut and gluten-free and also Paleo friendly. We use Otto’s Naturals Cassava Flour because they have a proprietary process that leads to a higher quality cassava flour compared to other brands. It is most similar to a traditional wheat flour, and in some applications can even be substituted in a 1:1 ratio. Like all things new, it may take a little getting used to in order to figure out the proper amount for any given recipe. I played with this Paleo pumpkin bread recipe a bit, noting that the this flour is a little dense and settles quickly, so you don’t want to use packed measurements. You will definitely have more success if you quickly whisk your flour just before measuring per Otto’s recommendation on their website. You’ll notice the texture and how similar it looks to a traditional bread recipe. There is just something comforting and cozy about pumpkin spice flavor. It is a little spicy and bold, yet warming at the same time. 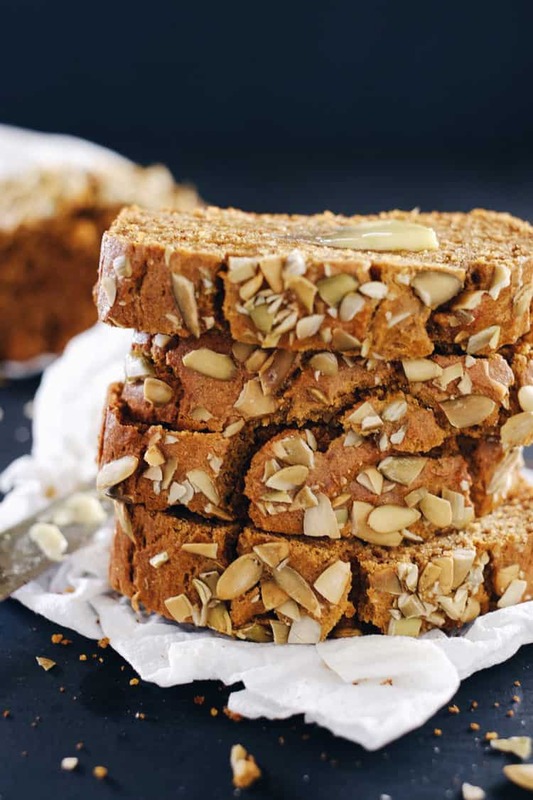 Go ahead and slather some coconut butter or grass-fed butter on a slice of our Paleo pumpkin bread and let the fall flavors take you away. Perhaps enjoy it with a cup of freshly brewed coffee or one of our pumpkin chai lattes. So much deliciousness to be had as the seasons change. 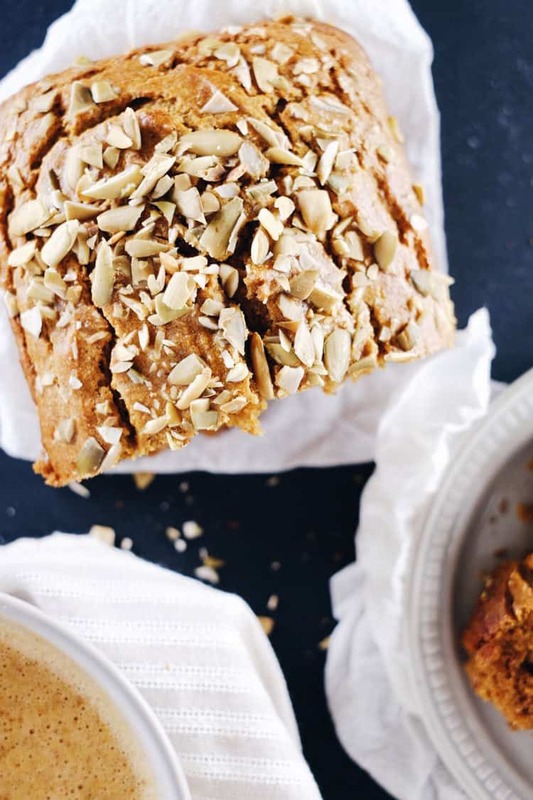 Now it is your turn to make a loaf of our Paleo pumpkin bread. It is simple and full of the bold and spicy fall flavors you are craving! Let us know how it goes by leaving a comment below. Then, take a photo and tag us on Instagram @realsimplegood, so we can check it out! Preheat oven to 350 degrees fahrenheit, and either line a bread pan with parchment paper or grease your pan with coconut or avocado oil. Place all of the dry ingredients in a medium mixing bowl, and whisk together until evenly mixed. Place all of the wet ingredients in a larger mixing bowl. Whisk until all the ingredients are smooth and creamy. Slowly pour dry ingredients into wet and continue mixing until all of the flour is thoroughly mixed into the wet ingredients. Pour batter into bread pan. Roughly chop your raw pumpkin seeds, and sprinkle them on top. Place in the oven to cook for about 45 minutes, or until a toothpick comes out clean. Once finished cooking, let cool. Slice and serve! This looks so good, I am ready to make the recipe! I instantly pulled out my bag of raw pumpkin seeds and then noticed that the recipe doesn’t mention the pumpkin seeds at all. They are only in the picture. My question is: Are the pumpkin seeds toasted before using? Do I mix the seeds into the bread batter before baking? Or do I sprinkle them on the top of the batter before baking the loaf? Looks delish! Have you tried making muffins instead of a loaf? Just a regular size loaf pan, like 8×4? I’m thinking of doubling it. Thanks! Thanks! I’m making it now so I”ll post an update when they are done. Well, unfortunately these did not turn out for me. They were extremely flat, which may be a function of doubling the recipe, and also kind of bland. I’m wondering if my pumpkin pie spice was old or something. Just not enough flavor. I’d like to try again as I like the ingredients and it was easy to throw together. And I guess I won’t double next time and see if it rises better. Thank you! Dang! That’s super unfortunate. Try sifting your cassava flour next time too. It is quite dense and settles quickly, so that could lead to them not rising much. Hmmmm…you could also add more pumpkin pie spice and cinnamon too if you feel like it needs a little boost! Sorry it didn’t quite turn out for you. Thanks so much for trying our recipe! Thanks for the tips! Do you mean sifting the cassava flour before measuring it? Yes, exactly! And then measure right away before it settles. It settles quickly! Can you use almond flour instead of coconut?im just not a fan. Unfortunately not. Coconut flour is much more absorbent than almond flour, so you can’t just swap it out at a 1:1 ratio. I haven’t played with it in this recipe, so I’m not sure how much almond flour you’d have to use in place of the coconut flour. You could give it a try and just slowly add more almond flour until the consistency feels about right. I haven’t tried it though, so I can’t say how well it will turn out compared to the recipe as is. I don’t mind coconut flour, so you might still be able to taste it a bit, but I feel like the other flavors in this bread mask the coconut flavor well. Good luck! 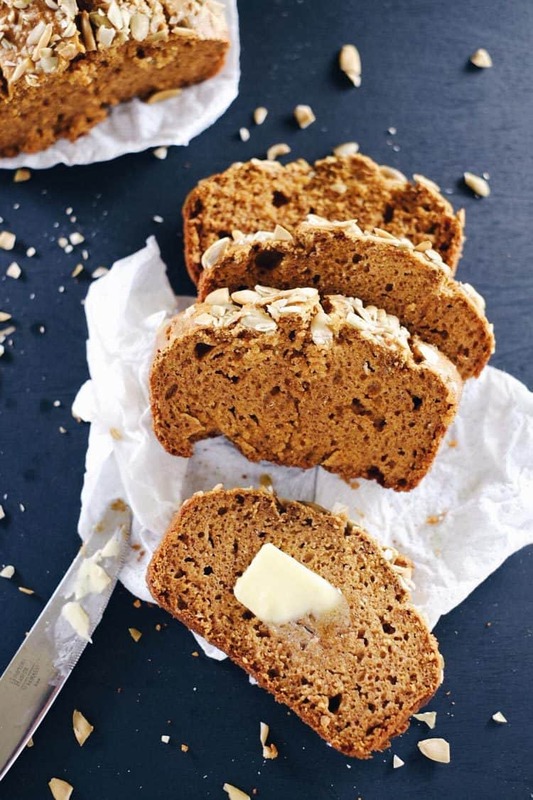 How many carbs are in the Paleo Pumpkin bread recipe? Can I use almond flour instead of cassava flour? We haven’t tested it so can’t recommend using almond flour or the quantity you would need to substitute. They are very different flours and could change the bread significantly.